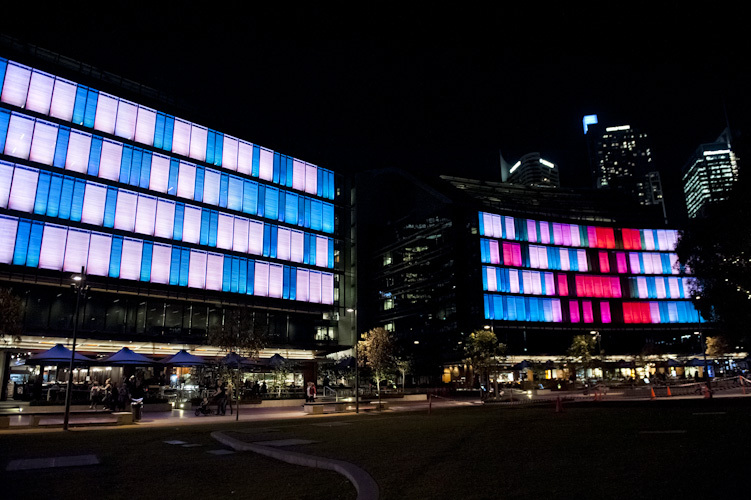 Sydney has the largest permanent interactive light display in the world. That’s pretty cool. Even more cool is the fact you can go on the Web and program the display yourself. In theory at least. The technology behind this is not just big it’s sophisticated. The ‘canvas’ extends over four levels of two buildings, covering 557 windows in total, and presenting a digital façade spanning a distance of 150 metres. Each window is in effect an independently programmable pixel on a giant screen. It was manufactured by Australian architectural lighting specialists Klik Systems and the results look great. Pleasingly, the whole thing uses about the same hourly energy as five household vacuum cleaners. The digital façade is in action six evenings a week. On Tuesdays, Wednesdays and Thursdays it displays ‘soft’ images such as clouds or waves. On Friday, Saturday and Sunday Luminous displays artworks that “aim to invite debate and make art critics – and artist – of every citizen and visitor”. That’s the really clever part of the whole thing. You can go on the web and program the display to show off your creative talents. But, sadly, before you can show off your creativity you need to be able to show off your ability to crack an almost impenetrable interface. Painting involves selecting a colour and picking windows to illuminate: That much, once you work it out, is simple. What is not clear is what happens next. There is no way to copy one design to the next frame so you can adjust it onion-skin like. So after spending a fair bit of time getting the word ‘geek’ on the screen I just couldn’t face doing it again for the next five seconds of display. There’s no easy way to replay what you’ve done and see what it looks like and no way to copy blocks of the design. All-in-all it makes for a very cumbersome design interface. What makes it worse is that there are no instructions. The design needs to run for a certain time and if it’s too short it says so but it doesn’t tell you how long it needs to be. Finally, once you submit your design if it is not accepted you just get a terse email saying your submission has been denied without any clue as to why. It’s all a bit difficult and disappointing. Using your smart phone, however, allows you to do more. There are a series of web apps with which you can finger paint, play pong or a number of other games and even have the wall respond to your movements as you wave the phone around. These apps seem much more intuitive and a lot of fun. Overall this is an absolutely great concept and a lovely addition to Sydney. However, for the promise of making artists of us all to be fulfilled the programming interface needs some really serious work. To try all this out point your web browser at www.myinteractivecity.com and your feet at Darling Quarter. My own show will be up in lights at 8pm tomorrow. I agree about how you do it, but stand by it not being obvious. It wouldn’t take much to make it easier in my view.